Samuel Parsons Johnson (a/k/a "S.P. "), son of Samuel Johnson and Martha Collier, was born on November 1, 1840 in Carroll County, MS. He died on November 22, 1922 (age 82) in Carroll County. 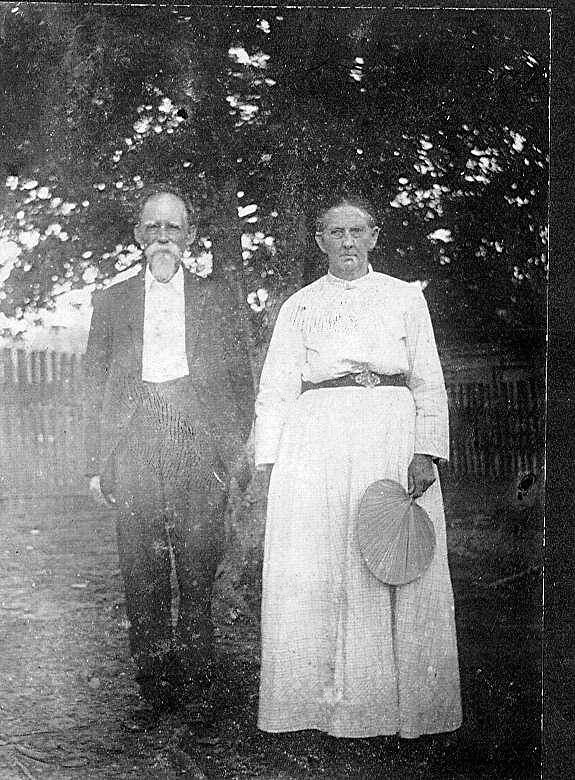 He married Susan Eliza Beck, daughter of Thomas Wright Beck and Esther Blackman Fellows, on March 26, 1867 near Black Hawk, MS. She was born on March 24, 1850 in Carroll County and died on December 30, 1930 (age 80) in Sunflower County, MS. Both are buried in Old Salem Cemetery in Carroll County near the city of Vaiden. 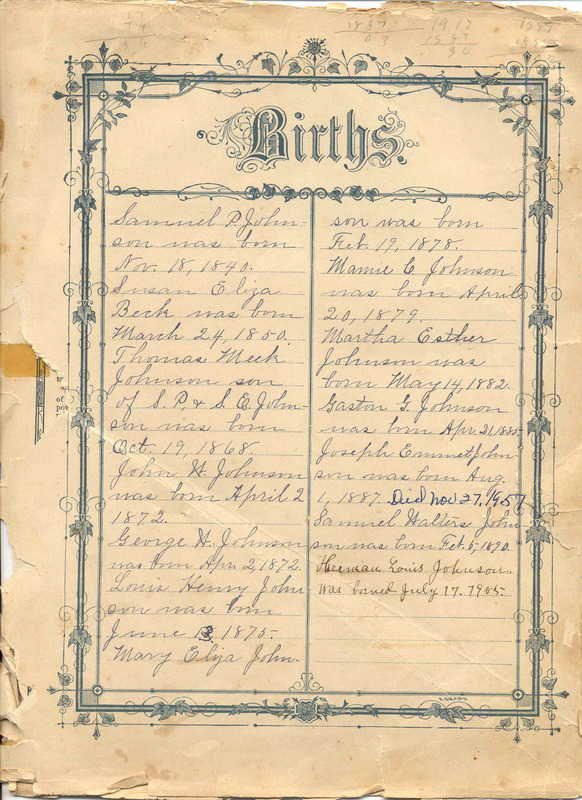 For more information on the descendants of S.P. and Susan, click here. 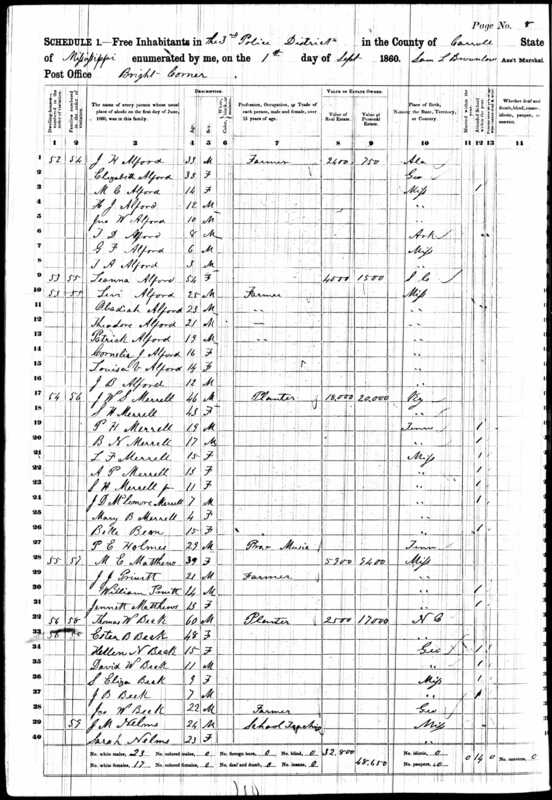 1850 Carroll County Census - S.P. is 10 years old and living with his parents Samuel (age 62) and Martha (45). Also in the household are siblings William (27), Sarah (20), Hugh (17), John (13), and Martha (12). 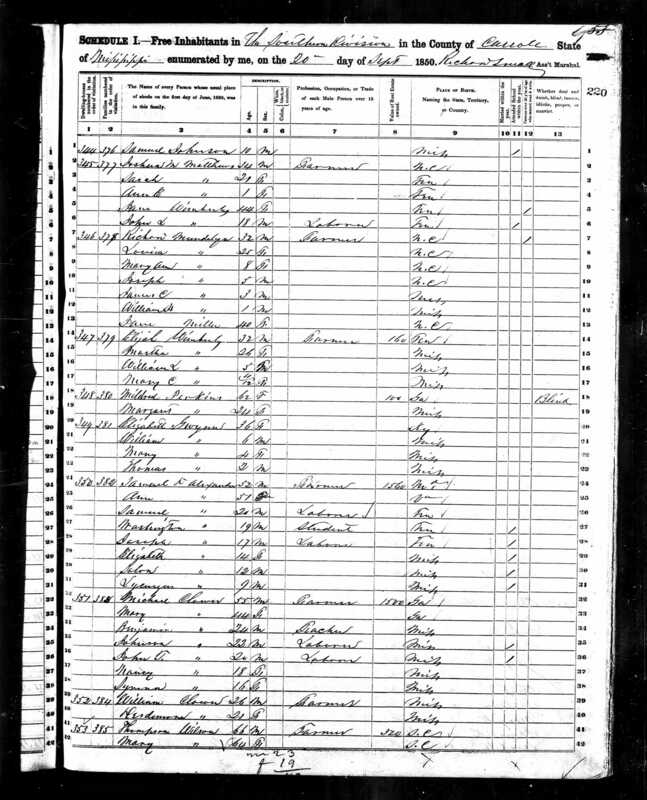 1850 Carroll County Census - "Eliza" is 3 months old and living with her parents Thomas W Beck (age 51) and Esther (38). Also in the household are siblings Mary (17), Catherine (14), John (12), Helen (5), and David (3). 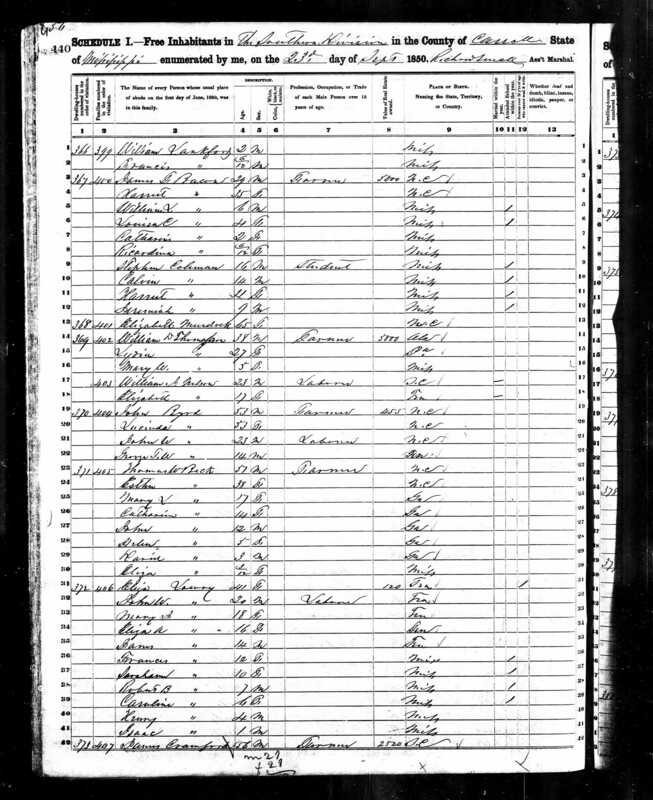 The census indicates that Thomas and Esther were born in North Carolina and all of the children were born in Georgia, except for Eliza who was born in Mississippi. 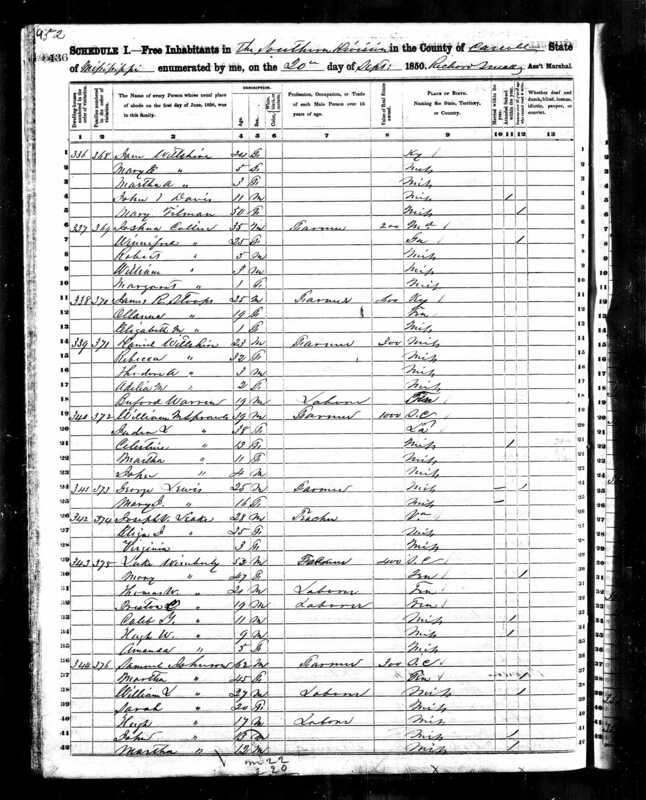 1860 Carroll County Census - "S. Eliza" is 9 years old and living with her parents Thomas W (age 60) and Esther (48). Also in the household are siblings John W (22), Helen N (15), David (11) and J.B. (7). 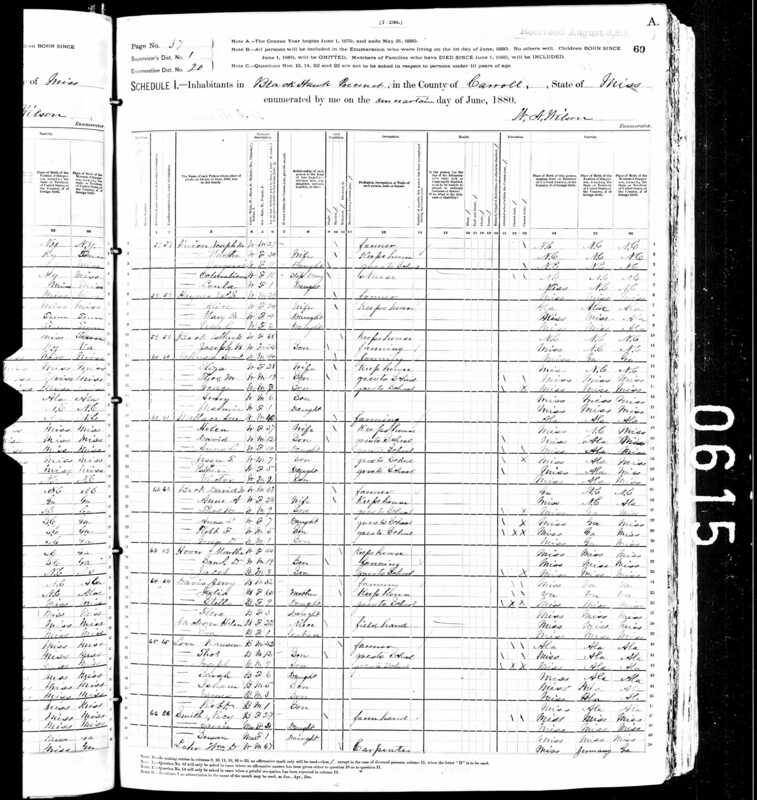 1880 Carroll County Census - Samuel and Eliza are 40 and 28 respectively. His occupation is farming. Also in the household are their children Thomas M (13), George (8), Henry (6) and Mamie (1). 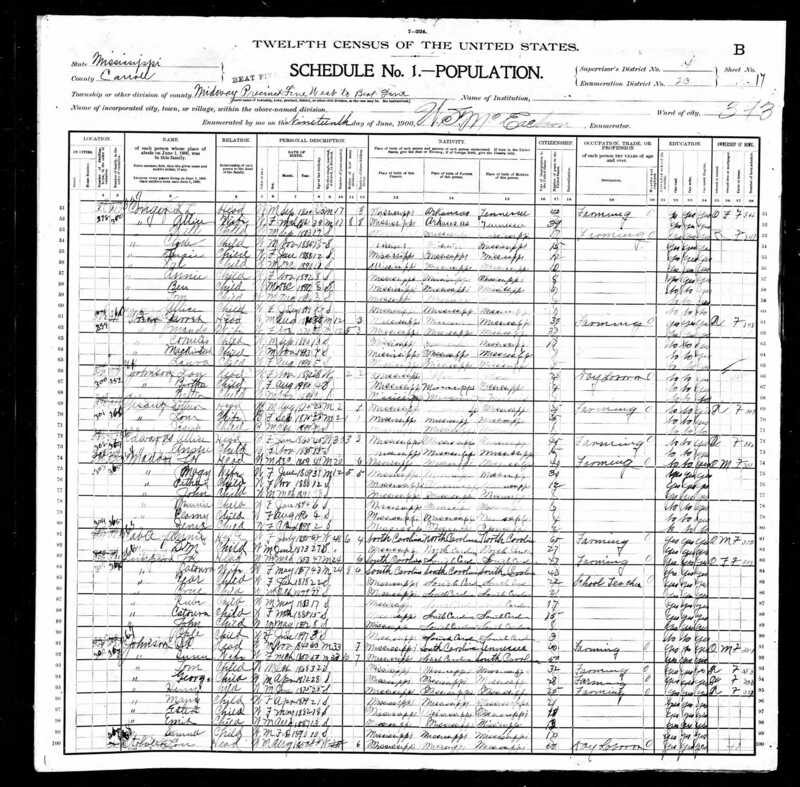 1900 Carroll County Census - S.P. and Susan are 60 and 50 respectively. His occupation is farming. 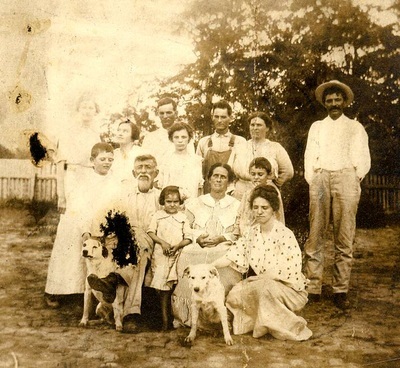 Also in the household are their children Tom, George, Henry, Mary (who must be Mamie), Esther, Emit (sic) and Samuel. 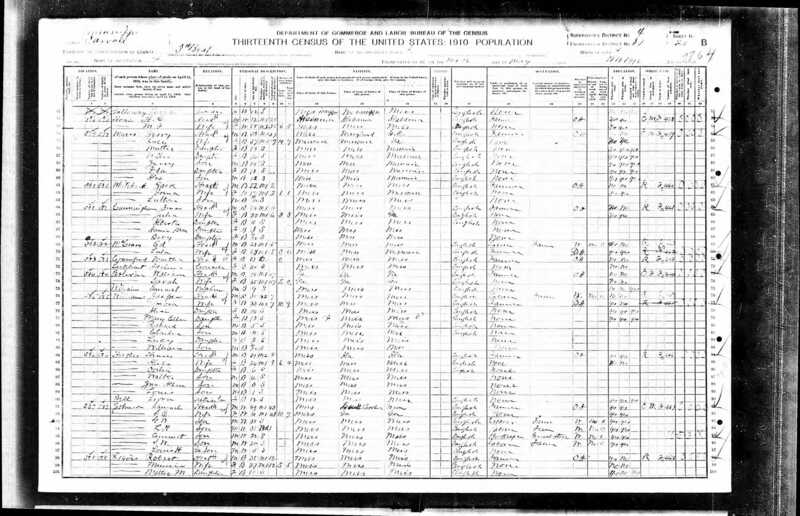 1910 Carroll County Census - Samuel and S.E. (Susan) are 69 and 60 respectively. Also in the household are their children G.W. (George), L.H. 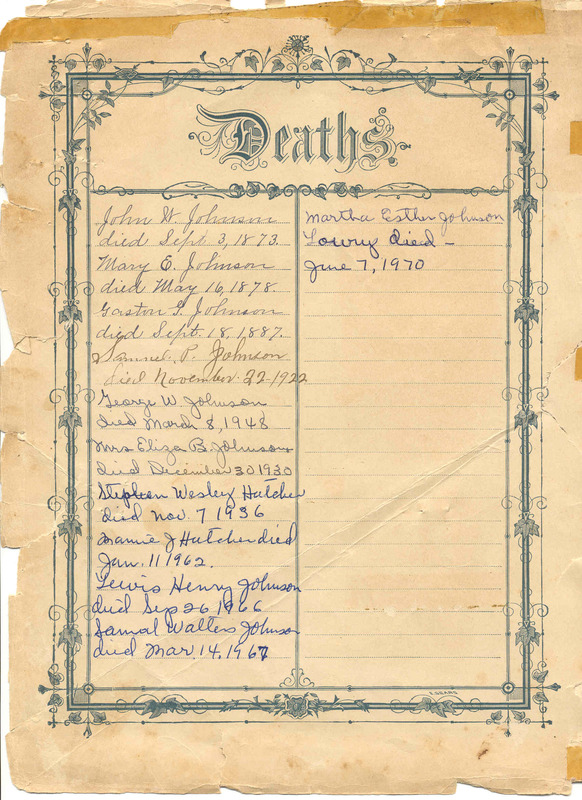 (Louis Henry who is now a widower), Emmitt, S.W. (Samuel Walter), and their grandson Louis H. (who would actually be Lewis Herman, the son of Louis Henry). 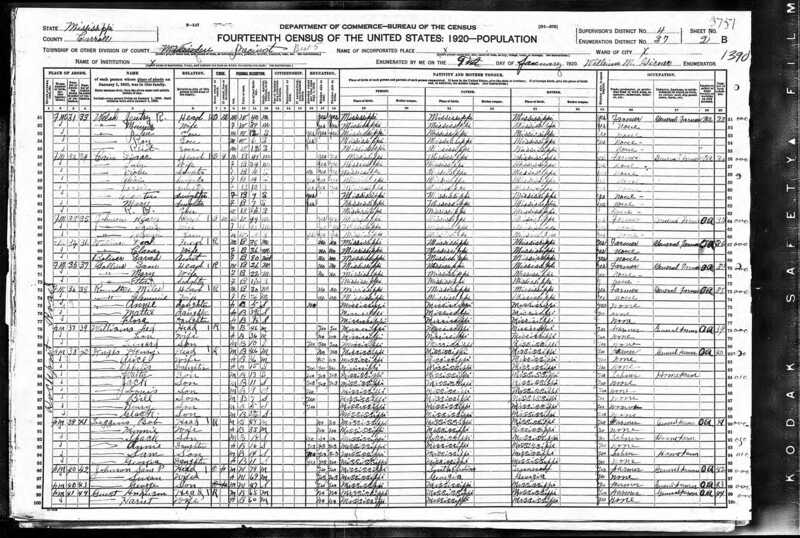 1920 Carroll County Census - Sam P and Susan are 79 and 69 respectively. They are living on Rockport Road with their son George, age 47. 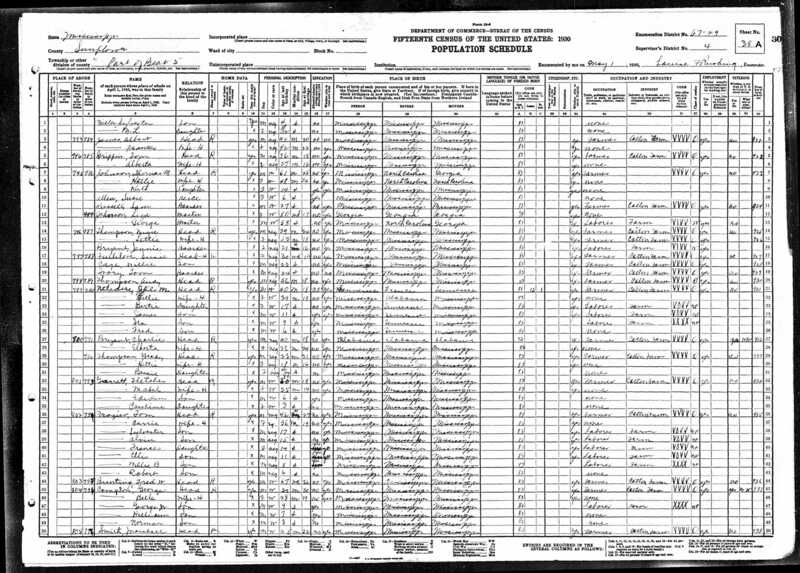 1930 Sunflower County Census - "Liza" now 80 and widowed is living with her son Thomas (61) and his family in Ruleville, MS. Also in the household are Tom's wife Hattie (48), their daughter Ruth (14), their niece Susie Allen, a border Sam Russell, and Tom's brother George (58). Thomas' occupation was cotton farmer. S.P. 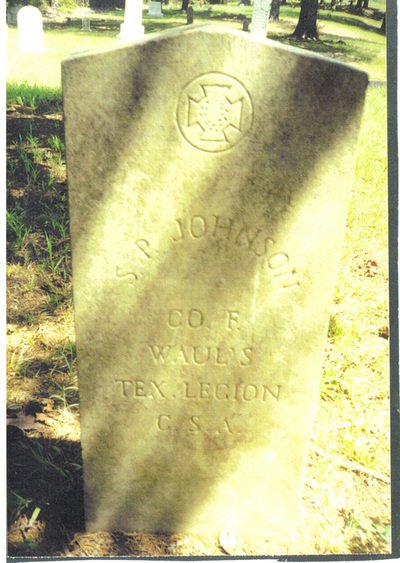 was a Civil War veteran, serving in Waul's Texas Legion, Company F, Willis Battalion. He enlisted in March 1862. 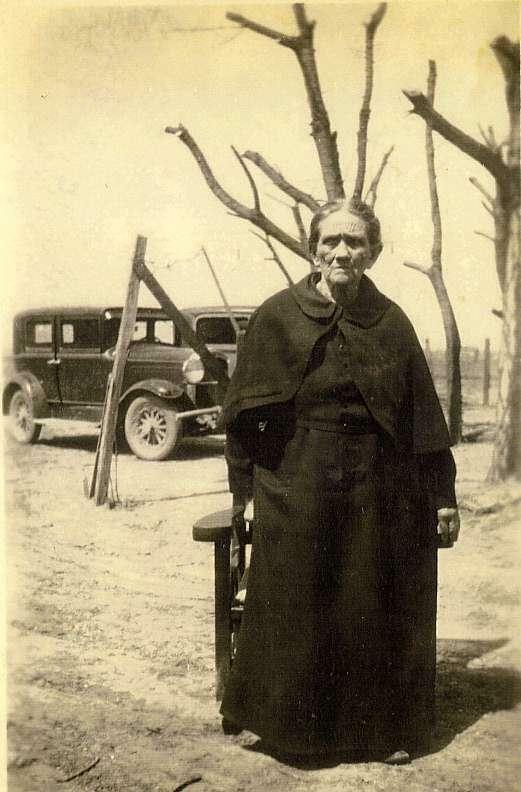 After her husband's death in 1922, Susan lived for a time with her daughter Mamie in Red Banks, Marshall County, MS. By 1930, she was living with her son Thomas in Ruleville, Sunflower County, MS where she passed away. 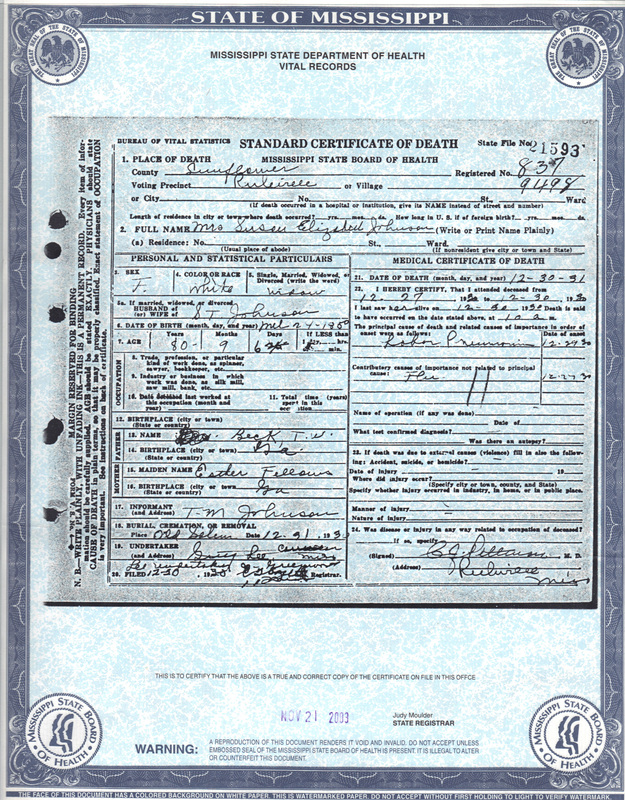 Susan's Death Certificate states she is buried in Old Salem Cemetery; based on personal observation, her grave is unmarked. The Johnson Family - S.P. Johnson and wife Susan Eliza are seated. Daughter-in-law Ada Mayfield Johnson is squatting next to Susan. 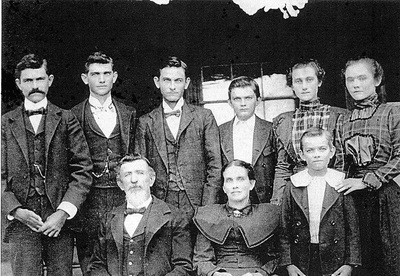 Sons Samuel, Louis Henry and Tom are standing in the back. Others are unknown. S.P. 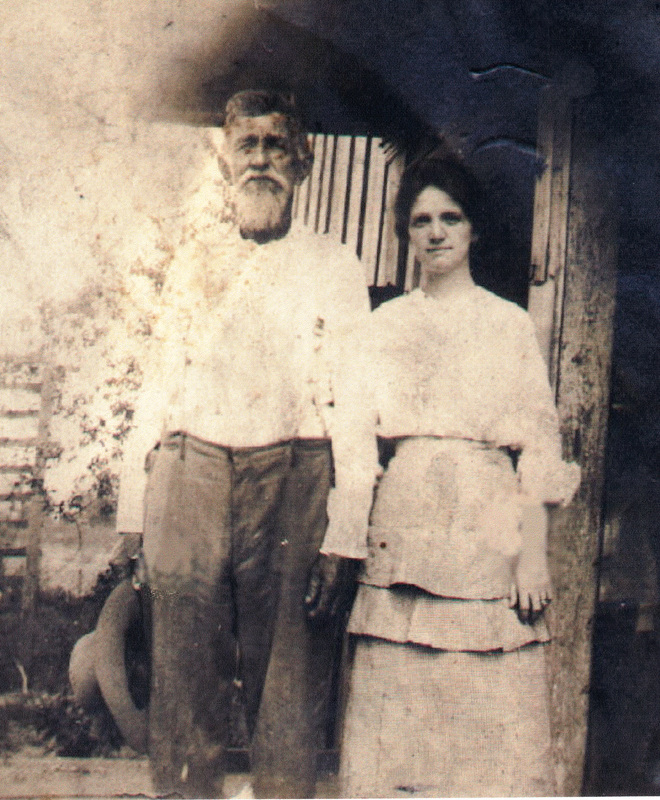 Johnson with daughter-in-law Ada Mayfield Johnson, wife of Joseph Emmitt Johnson, Sr.
S.P. 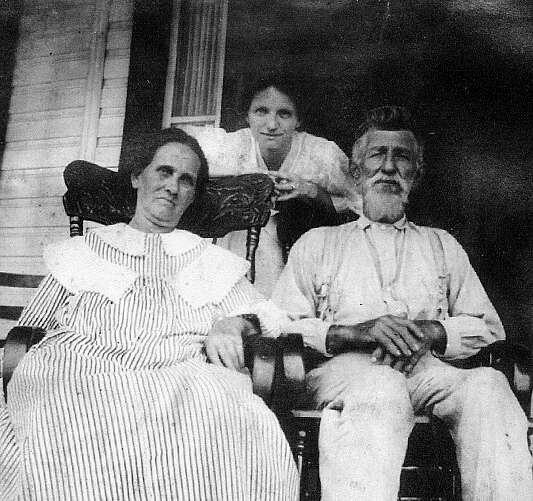 Johnson and Susan Eliza Beck Johnson, with their daughter-in-law Ada Mayfield Johnson (center), wife of Joseph Emmitt Johnson, Sr.